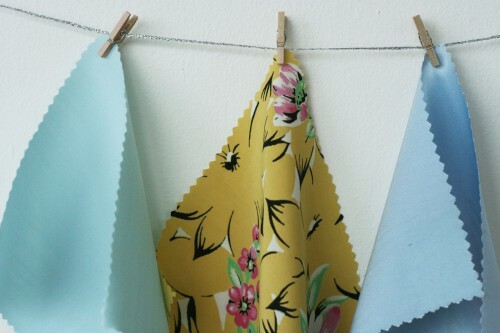 This last post in our fabric series covers two lovely types of materials, linen and rayon. In previous posts we discussed common types of materials and distinguished between the way they were woven. Now that you’ve seen these different weaves, it’s important to understand that they aren’t exclusive to to the fiber. For example, charmeuse can be made not only from silk but also polyester or rayon, which are fibers that can recreate the high sheen of silk. Both linen and rayon come in many kinds of weaves and some knits. We live in a time of infinite fabric choices. 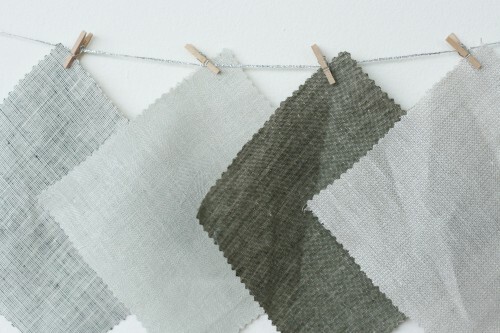 Fabrics are made with multiple materials, colors and weaves. You name it, it’s out there! If you’d like to look back on the previous fabric series posts, click on the following links: silks, cottons, wools. We’d love to know your thoughts on fabric! What has helped you to learn about all the different kinds out there? What inspires your fabric choices? Do you have any suggestions for fabric care that’s worked especially well for you? Linen fabric is an ancient textile made from flax fibers. It’s been used for centuries as clothing and for home use. Linen comes in many different weights and is most commonly available as a straight weave fabric. It wrinkles very easily. No matter what the weight of the fabric, pure linen allows air to pass quickly through the fibers which keeps the skin cool. Moisture also evaporates quickly from linen garments, making it an ideal material for summer clothing. Some linen has a bumpy texture with irregular slubs which indicates poor quality threads. The best linen is smooth with no bumps or irregularities. Linen sews up easily into most kinds of garments. Be sure to test the drape and hand (feel) of the fabric before purchasing to ensure you purchase the correct weight for your garment. Rayon is a synthetic and natural blend of cellulose fibers. It can easily be woven to resemble the texture and feel of natural fibers such as wool and silk. It doesn’t insulate body heat, making it perfect for warm climates. Rayon is available in many prints and makes lovely dresses and shirts. It’s often found in a plain weave with a silky feel and a soft drape. Rayon does stretch out with wear and wrinkles easily. It must be hand washed and hung or laid flat to dry as the fibers aren’t strong enough to withstand much machine washing. Thanks again for the series on fabric – great job. I really want more quality fabric choices. The series has been really helpful, but I have trouble distinguishing fabrics. I’ve seen something on burn testing, but can’t get past smells like paper/ smells like hair! You can figure out a fabric’s general fiber content from burn testing without just relying on the smells. If you hold a lighter to a small scrap or thread pulled from a fabric, you can observe the way it burns. Wool and other protein will often self-extinguish once you remove the flame, whereas cellulosics will burn rapidly (be careful!). Synthetics fibers will ball up and melt/pool, like plastic. Something that would be helpful to include in this fabric series are the multiple names that some fibres/fabrics go by. For instance, this post needs to highlight that viscose = rayon! I remember as a beginner sewer looking for something with spandex, and not knowing that elastane was the same thing! Can lead to needlessly fruitless fabric searching! Hi, I know I’m a little late with this, but I was wondering if you could tell me a little more about rayon slub. How does it compare to rayon challis? I have never used rayon, but would really like to try it, but I find that most of the selection of rayon challis in stores and online is very ugly. I have seen some cute prints in the rayon slub, but I have never seen this fabric in a store, so I’m not sure what to expect with it. Thanks! I was looking for the information on Linen and Rayon blend material. Especially for care, wasing etc.